TELL CITY—Benedictine Father Barnabas Gillespie is the pastor of St. Michael Parish in Cannelton and St. Pius V Parish in Troy in the Tell City Deanery. He also provides sacramental assistance at St. Paul Parish in Tell City and St. Mark Parish in Perry County. Father Barnabas, 63, professed vows as a monk of Saint Meinrad Archabbey in St. Meinrad in 1973 and was ordained in 1980. He was born and grew up in Cincinnati in the Cincinnati Archdiocese, and was a member of St. Boniface Parish there. Planting the seeds of a vocation—Father Barnabas said his parents and his Catholic education planted the seeds of his religious and priestly vocation. “[My parents] were very faithful,” he said. “My father was especially active. He was active in the St. Vincent de Paul Society. He was one of the first lay lectors [in the parish]. He was very active in the Knights of Columbus. High school seminary—When he was in the eighth grade, he had a friend who chose to enter a high school seminary operated by Franciscan friars based in Cincinnati. Challenging times—He graduated from the high school seminary in 1965, then enrolled at a Franciscan college seminary, but discontinued his studies there after his first year. He then studied education at the University of Cincinnati during the second half of the 1960s. It was a tumultuous time to be a college student, especially in 1968 when riots forced the university to be closed temporarily. Nevertheless, the idea that he might be called to be a priest persisted. Coming to Saint Meinrad—Father Barnabas had learned about Saint Meinrad Archabbey while he was a student in the Franciscan-run seminaries. He went on a couple of private retreats there in the late 1960s and early 1970s, and felt that God was calling him to monastic life. He became a candidate at the monastery in 1971, a novice in 1972, professed first vows in 1973 and professed solemn vows in 1977, 17 years after he began to discern his vocation. Ordination—Father Barnabas was the first priest ordained in the archdiocese by Archbishop Edward T. O’Meara. The liturgy occurred on April 27, 1980, the anniversary of Father Barnabas’ baptism. Parish ministry—For different periods over the past 30 years, Father Barnabas has ministered in a variety of positions at the monastery. But he’s been involved in parish ministry for more than half of that time. 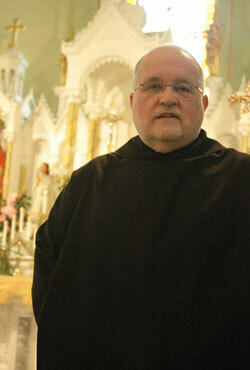 Since 1998, he has ministered as the pastor of St. Michael Parish in Cannelton and St. Pius V Parish in Troy. “This has been the happiest 12 years of my life,” Father Barnabas said. “I couldn’t have more wonderful people to serve. I just can’t imagine it. Part of that generosity has been elicited through Father Barnabas’ leadership style. More challenging times—During the past 12 years of leading his two parishes, Father Barnabas has endured periods of turmoil in the Church in the United States related to clerical sexual abuse. Nevertheless, his own faith and vocation have remained firm—something he sees as a blessing from God. When he feels most a priest—“I feel most a priest when I am administering the sacraments [and] the Eucharist, above of all, but the rest of them, too,” Father Barnabas said. “But also at times of death and being with the families, not just at the time of the funeral. All of the parishes around here offer a funeral meal. It’s always important for me to be there at that meal just to show that I care.